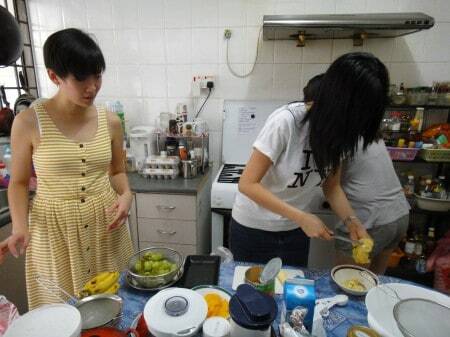 2 weeks ago, some of my girlfriends from my women’s group came over for a cooking session. We decided to make pancakes. I had this recipe that I wanted to try out for some time now but I needed people to come and eat. This was really the perfect timing. 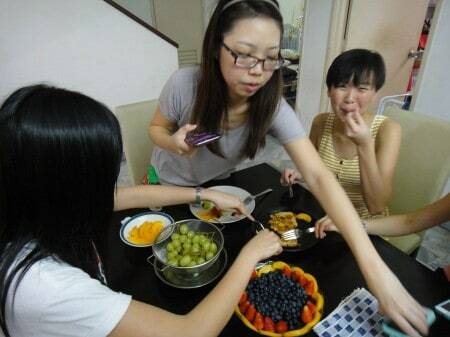 The girls bought all sorts of fruits as toppings or fillings. Of course they could not help taking out their smartphones and instagrammed everything. I really love cooking sessions, that way we get to try many different things. It was time to dig in! I tripled the recipe for this cooking session and had like a jug left. I refrigerated the rest and had some the next day. The batter somehow was even better the next day. I ate them savoury style. 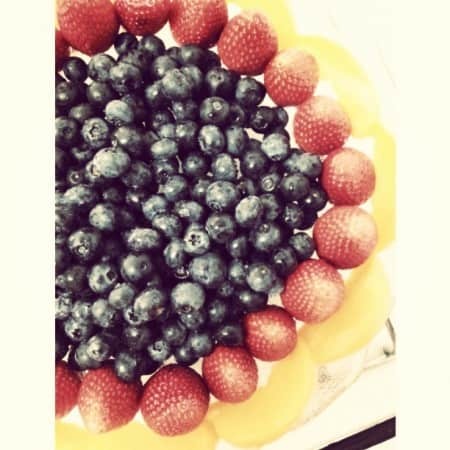 But there were still some fruits left, actually plenty, much to the delight of my four year old….he happily polised off the peaches and grapes while I did something with the blueberries that I thought went great with the pancakes. 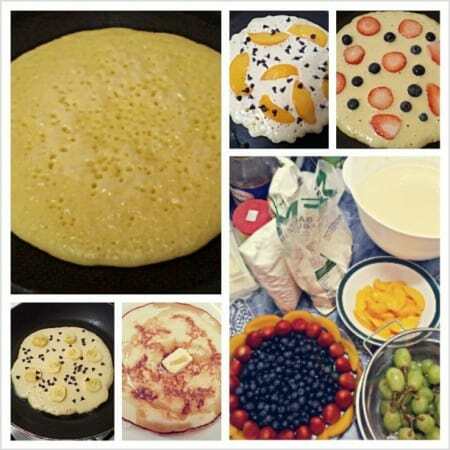 I love to cook my pancakes on a rather dry pan with very little oil or butter because I like to have that even browning on the entire surface of the pancake. But some peeople like to add plenty of butter to cook the pancakes and that will produce a very different cooked surface on the pancake. But to each their own. With the blueberries, I made a simple compote, which is like chunky fruit stew. I cooked them down with a little water and sugar and slow boil it till the syrup has thicken. 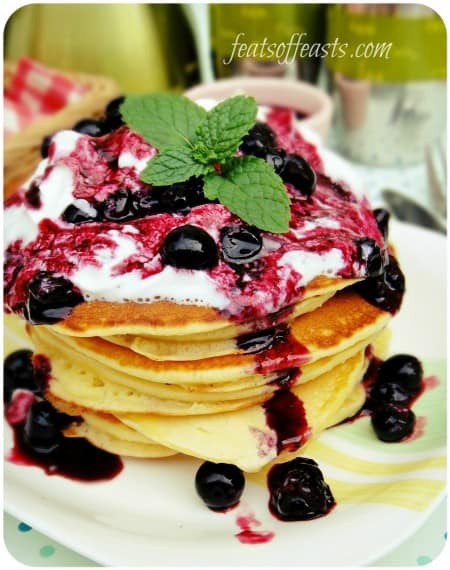 While it’s still warm, I piled on some cream and drizzled the blueberry syrup all over the pancakes! Yums! 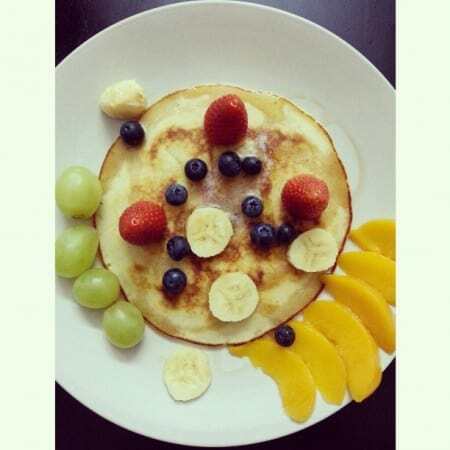 Really my favourite way to eat pancakes sweet style! 1. 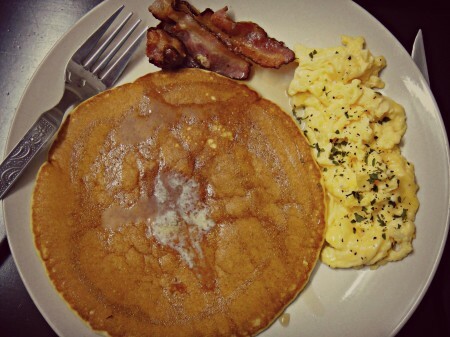 Beat eggs with milk till frothy, add melted butter and vanilla, beat till well mixed. 2. Mix all dry ingredients together; flour, salt, baking powder and sugar. 3. Mix the wet ingredients and the dry together. Whisk with an electric whisk till you have no lumps but do not whisk for too long. 5. While this is going on, tip all the blueberries into a saucepan. Put the heat on low. Add the water and sugar. Let it come to a slow bubble. Swirl the pot around, don’t stir with a spoon. Let the blueberries soften, their juices run out and thicken. Shut off the heat and leave it to cool. 6. Heat a flat pan, add oil or butter or have it dry, it’s up to you. Cook your pancakes on first side, when the surface has bubbly holes, flip it over. 7. 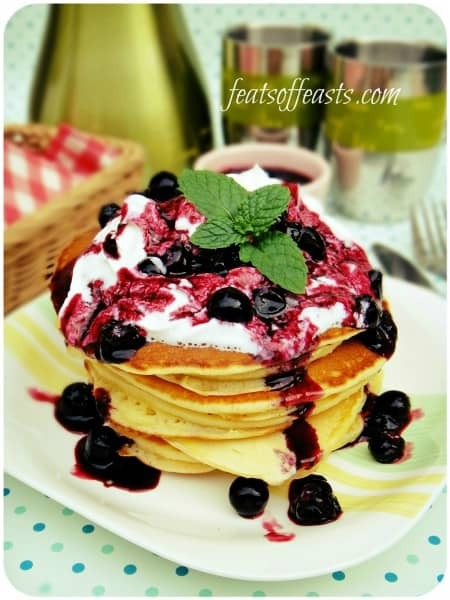 Eat with cream and drizzled with blueberry compote. Hi Sharon, your last few shots of the stacked pancakes is awesome! Wouldn’t mind some of that too, though I would really struggle to finish the whole stack. Share share? That’s a very tall stack! I’ve been waiting to make blueberry pancakes for ages (the one where you have blueberry in the pancakes themselves) and this just reminded me again! The last few photos are superb! 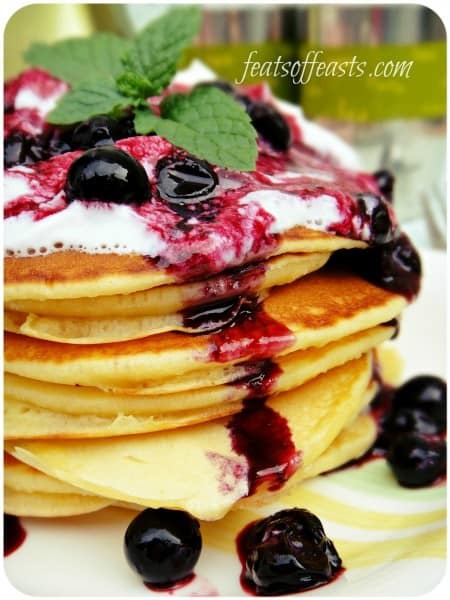 Love the look of these pancakes with the blueberries. I could eat them for breakfast, lunch and dessert!